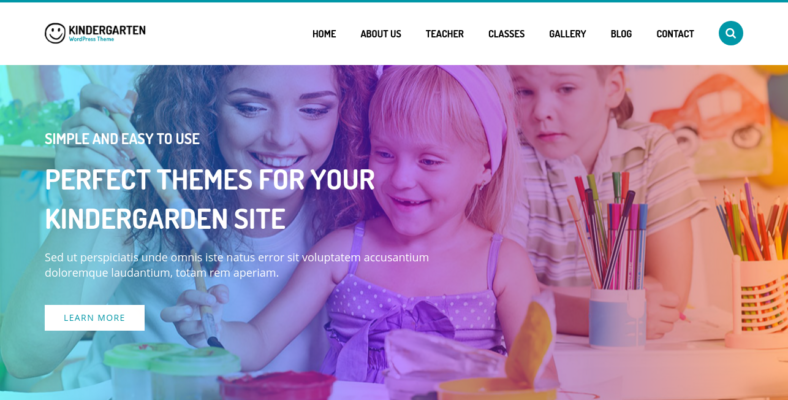 If you are looking to make a kindergarten WordPress or a kids WordPress theme, then you are definitely in the right place. You can use your website to help convince parents to enroll their child in the prestigious kindergarten school you own or work for. Let’s go ahead and check out the themes we’ve prepared. 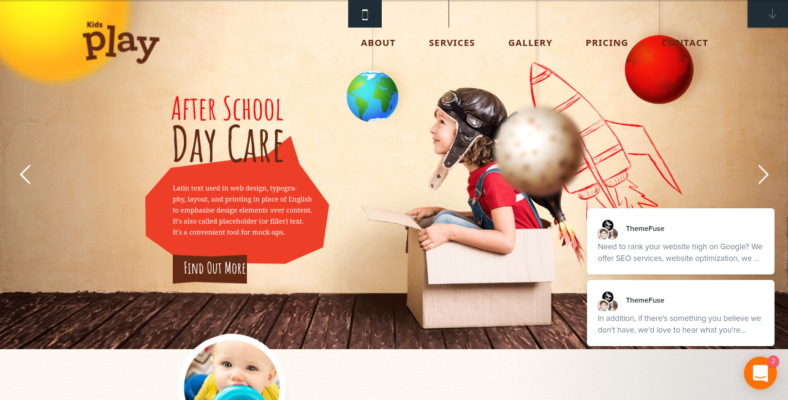 SmallSteps is a responsive WordPress theme that was specifically designed for a kindergarten site. It is full to the brim with useful and helpful features that will ultimately improve your site’s functionality. One of its many features is the multiple layout options, which gives you the chance to experiment with different structures for your web page. You also have numerous content modules that you can add to your pages like the blurb button, number counter, and map. The theme has also been crafted to perfection and has been fashioned to conform to the most recent design trends circulating around the globe. 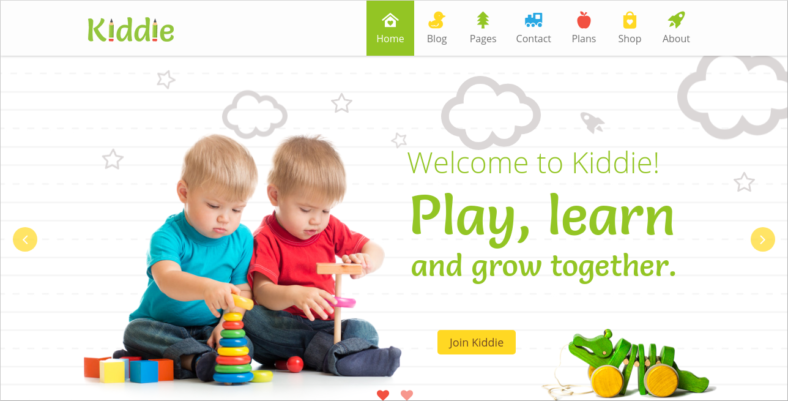 Kiddie is a newly created WordPress theme that sports a responsive and retina-ready design. The theme has over 20 predefined pages that you can experiment with, constantly trying each one out until you find the one you are looking for. It has built-in analytics too, giving you the chance to take a look at the SEO statistics clearly and plan your next move. The interface is very user-friendly and was clearly designed for users who aren’t tech-savvy. This is also a premium theme and is a part of the 100 premium responsive WordPress templates list. 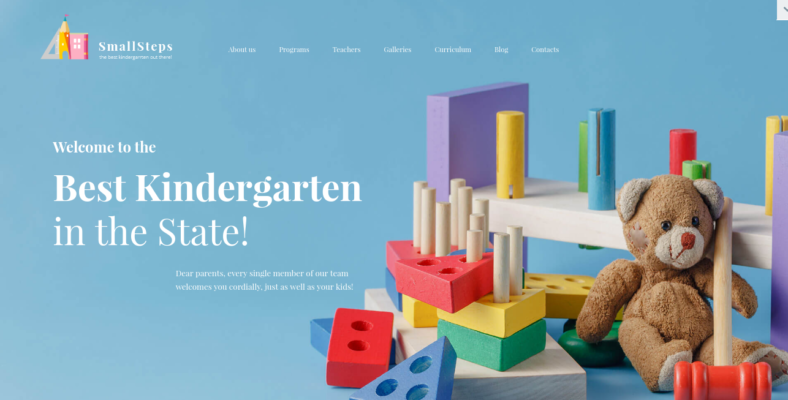 Primary is one of the most capable kindergarten WordPress theme in this list, and once you get introduced to some of its features, you will understand why. There are a couple of PSDs, short for Photoshop Document(s), available in the template which can be used to enhance its aesthetic value. It has more than 20 design UI elements, unlimited color options, and cross-browser compatibility. Also, the template is WooCommerce-ready, which means you could sell event tickets and courses online. With this added functionality, your site could be considered as a part of the business WooCommerce WordPress themes. 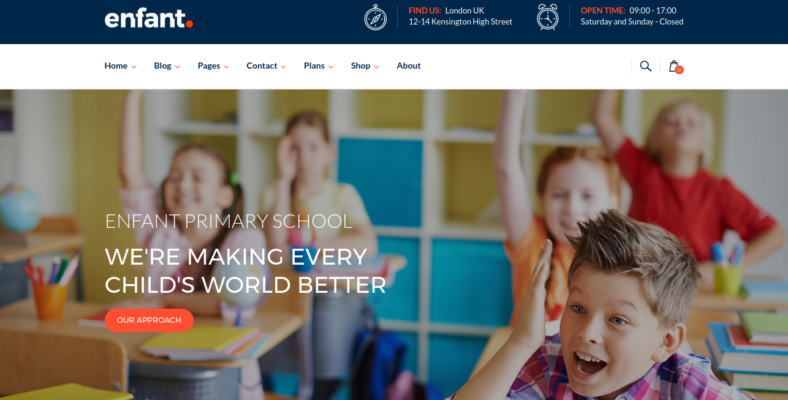 PE School is one of the many kindergarten school WordPress themes that sports a beautiful design. It can adjust itself to fit into any size of a screen, on any kind of device, whether it’s a tablet, desktop, or mobile phone. Aside from that, the site takes into consideration the needs of people with disabilities and complies with Web Content Accessibility Guidelines (WCAG). Like many similar ones here, the theme also shows the profiles of the school’s teachers, so those who would like to enroll have the chance to know the educators a little bit more. This theme has a plethora of features to offer to its users and potential site visitors. For one, it is very easy to use and does not require any kind of background, or knowledge, about complex codes. It has a live customizer, which lets you make changes and view them in real-time. With more than 600 Google fonts to choose from, you can definitely consider this one as an excellent typography WordPress theme, capable of giving you advanced editing opportunities for your site’s fonts. You’d want to reach more parents and kids, which is why the template is SEO-ready for your convenience. 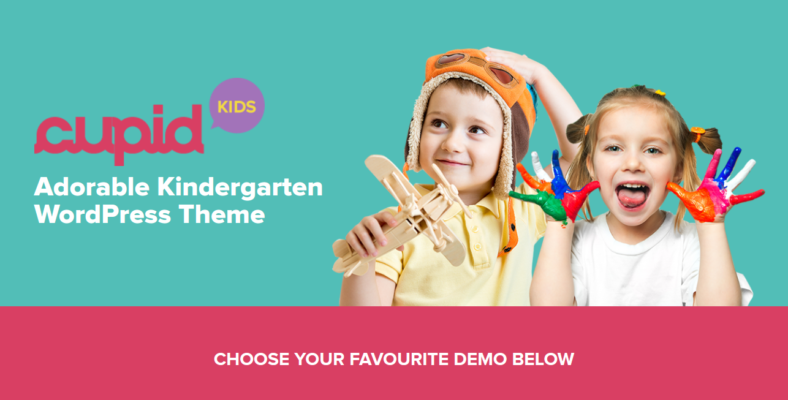 Edukid is a kindergarten WordPress theme that provides its users with numerous options to create the website that fits their ideals. The theme has an infinite number of courses, integrations for BuddyPress and bbPress, as well as different quizzes with simple, or multiple, answers. It also includes profiles pages for the instructors and allows site visitors to take a look at their credentials, field of expertise, achievements, and more. The courses vary in price range and some of them require payment, while others are completely offered for free. This is definitely a kids WordPress theme you should definitely check out. 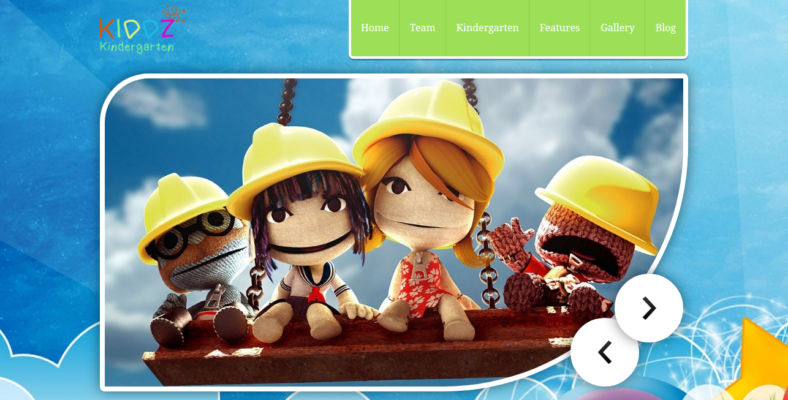 Kids Play is one of the best WordPress templates for any kind of child-related sites. You get to edit the theme’s typography, thanks to its integration with Google, which is a very helpful tool to help you personalize the theme to your liking. Integrations for BuddyPress will help you handle the social networking tasks, while the bbPress integration will let you have a discussion thread, or forum, on your site. Both will help you gain traffic and learn from the customers themselves about your site’s needed improvements. It is also retina-ready, which means it can help prevent eyestrain when visitors have been viewing the site for too long. With Bootstrap 3 and a responsive design, you can bet that this is definitely one of the fastest WordPress themes in the market. It also has its own arsenal of top-notch features, all of which aid in the enhancement of your kindergarten site. It supports multiple languages and is translation-ready. You have various post formats to choose from, namely Image, Aside, Video, Gallery, Standard, Chat, Link, Image, and Quote Status. The theme is also search engine-friendly, which means you have a bigger chance of getting a high rank in search engines like Google, Yahoo, and Bing, making your site appear first on search results. 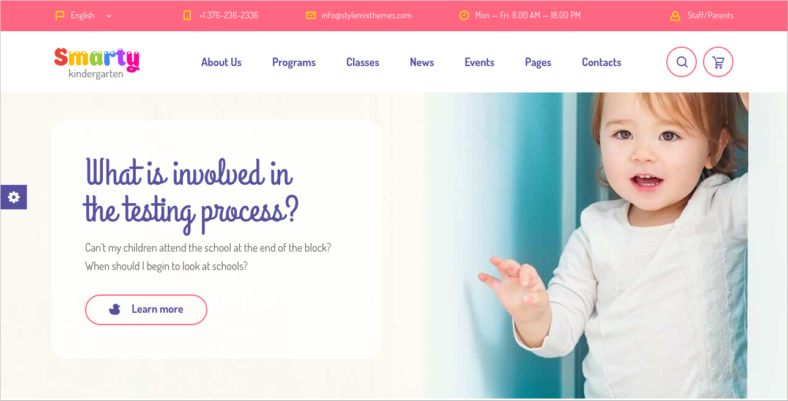 Highridge Center makes the whole process of creating your own kindergarten website easier and hassle-free, thanks to its drag-and-drop page builder. The site is used to help promote, manage, and take care of the school itself. It is quite normal and unavoidable to have a couple of appointments from parents every now and then. In these cases, the template’s appointment manager will help make the booking process a whole lot simpler for you and your customers. They can book appointments online all thanks to the appointment plugin that the theme offers. Appointment plugins are also common in educational themes for schools and universities. 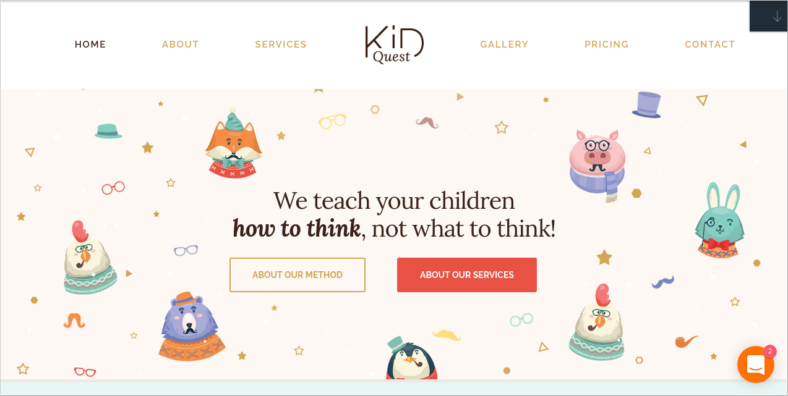 If you are looking for a child-related free WordPress template that offers everything you need for your kindergarten website, then Kid Quest is definitely for you. The theme offers up to three built-in sliders, one with six variations you could choose from and two premium ones, which are the Revolution and Layer sliders. Changing the template’s colors is pretty easy and you get to choose from five predefined colors that match each other. It also sports a drag-and-drop visual builder, perfect for any type of user, whether advanced or novice. 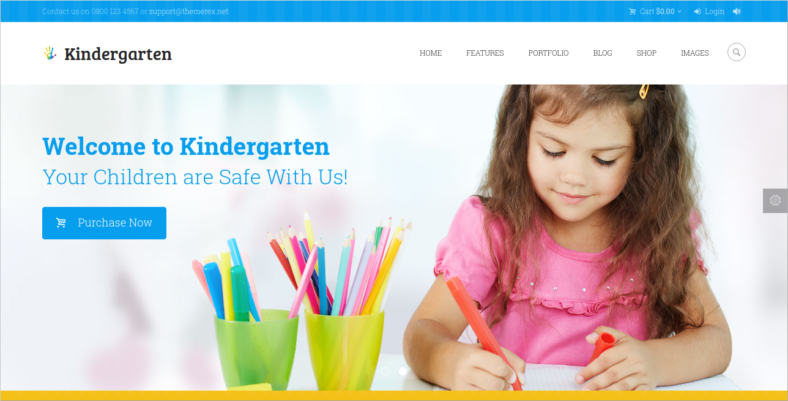 This one is definitely a kindergarten school website theme you wouldn’t want to miss. Building your own kindergarten page may very well mean that there is a possibility to offer online lessons for customers. With that being said, Play School is one of the top online education WordPress templates and it will certainly help you make a kindergarten site worthy of praise. It is compatible with any type of LMS, short for Learning Management System, plugins like Woo Sensei. The header has five different variations that you could experiment with, has numerous animated blocks that you can add, and it is very suitable for online courses if you have any plans of offering some to customers. 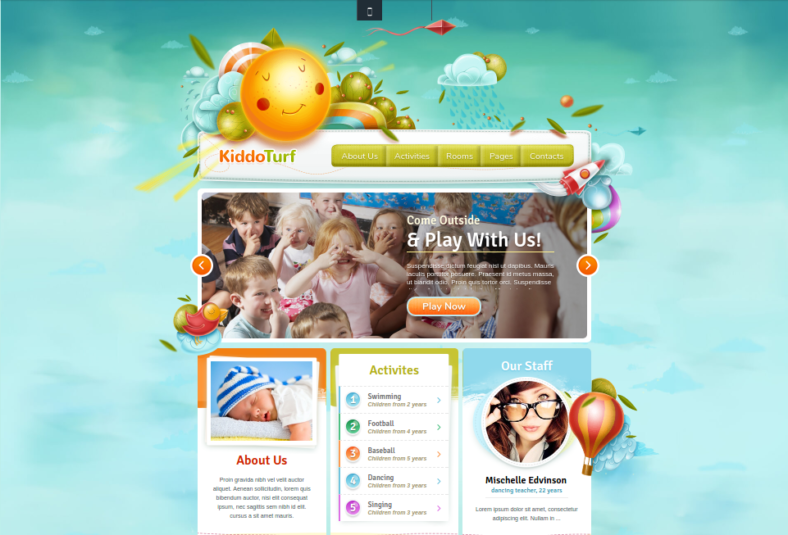 KiddoTurf is a theme that is 100% responsive and retina-ready, which means it can be viewed on any type of device and on any screen size without causing undue strain on the eyes. The handcrafted illustrations provide both users and site visitors a unique experience with the site’s design. If you’re not into creating, or personalizing, your site’s layout, then the template has built-in page layouts prepared for you. The theme runs on the Fuse framework, which provides fast and efficient performance. It has a contact form module and unlimited sidebar options. Aside from all of these features, it is also one of the most gorgeously designed themes on the list, truly making it one of the beautiful WordPress themes in the market. 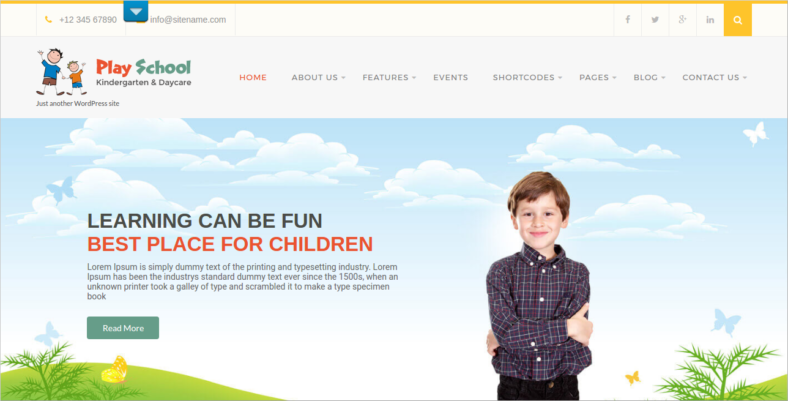 Enfant is considered to be the next generation and is one of the most salient WordPress themes for kindergarten websites. The template’s design is perfect down to the tiniest pixel and is totally user-friendly as well. The design is responsive, too, capable of being viewed on multiple devices like tablets, mobile phones, and desktops. It has contact form 7 integrated into its design as well, which lets visitors get in touch with you whenever necessary. To help you market your site, even more, the template has been integrated with MailChimp, to help you send out marketing emails to customers. Saratov is a vibrant WordPress theme that lets off a jolly and enthusiastic vibe, thanks to its amazing colors. Installation is pretty easy and it only takes one click to be on your way to utilizing the theme. There are even a couple more PSD files waiting for you for only $12. The theme’s documentation is superb and it truly helps with the overall tasks of managing the template. You get to insert an unlimited number of pages on your theme, which can come in pretty useful when you find that the number of tasks has risen. But probably its best features is the WordPress Calendary plugins, commonly known as Events Calendar. 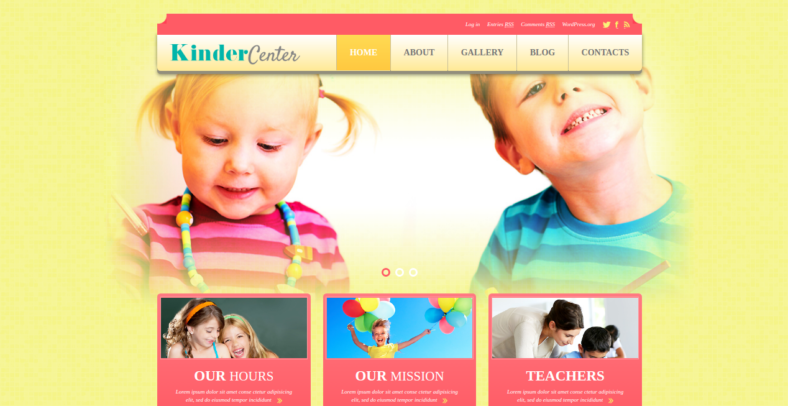 Kids Center is one of the many responsive kindergarten WordPress templates here on the list. However, being responsive is not the only thing that it has going for itself. The theme is also fully editable, giving you the chance to make changes to its typography font, sliders, and sidebar position. It supports multiple post types and post formats as well, which is perfect for organizing different kinds of content on your site. It has the WordPress Multilingual Plugin, too, giving it the capability to be translated into various languages, making it a multilingual WordPress theme in its own way. 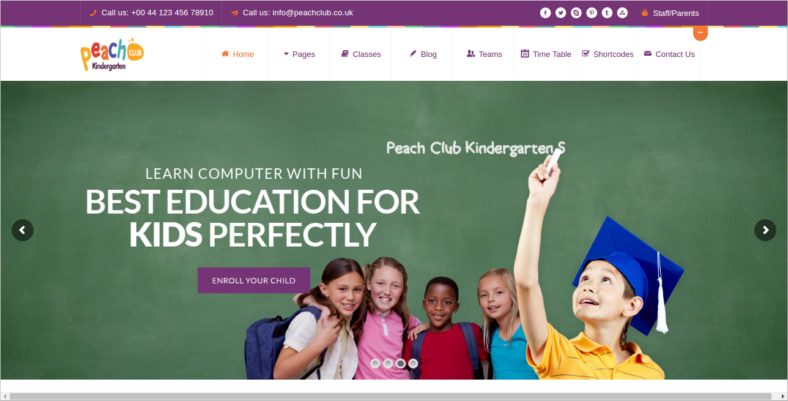 PeachClub is a professional kindergarten WordPress theme that has been designed to specifically cater to the needs of kindergarten schools, daycare, and preschools or nursery centers. During the customization process, you get to choose from an unlimited array of colors. You can also manage the timetable, in case you have to make adjustments for classes that have already been booked and other reasons. Managing the class is very important and this feature will let you limit the number of students for each one. You can also manage your members, adding and assigning teachers to different classes, essentially making it some kind of a teacher WordPress theme. VW Education is one of the many clean and simple WordPress themes that you can find online. It may not be as spectacular-looking compared to the other templates on this list, but what it lacks in aesthetics, it certainly makes up for it with its features. First of all, you won’t be expecting anything less with the template’s slideshow, thanks to the Slider Revolution that has been embedded in its range of capabilities. It can support RTL, short for Right To Left, languages like Arabic, Aramaic, and Persian. To top it all off, the theme is also WooCommerce-integrated, perfect for offering online courses. Hot Kindergarten was designed to look exactly like a children’s book. The theme is filled with fun scribbles and drawings, aiming to show kids and parents that it is possible to have fun and learn at the same time. It is powered by the Sparky Framework, which is a very flexible and customizable layout. You won’t have to worry about browser issues because, like many templates on this list, this one also has cross-browser compatibility and works with Safari, Chrome, and Firefox, to mention a few. With the grandiose design and graphics, one can easily conclude that this is definitely one of the most stunning 3D WordPress themes out there. 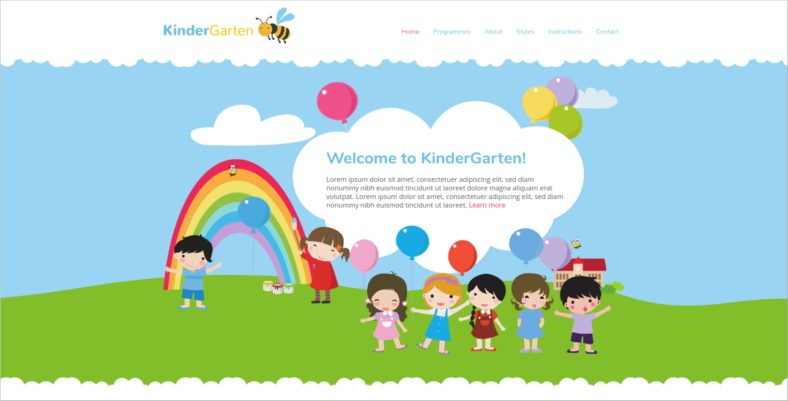 Kindergarten is a children’s website theme with a brilliant design that would certainly capture anyone’s attention. The template has been optimized for mobile devices like tablets and smartphones. You can add a bookmarks panel to the theme, which would be very useful for customers and online students, as this would let them bookmark the lessons they have taken up and quickly know where they left off. The template’s search engine is quite interactive, as it utilizes Ajax search. You can even add video backgrounds and Parallax elements to make your site look more amazing. It is also a multipurpose WordPress theme, making it quite usable for any type of website. 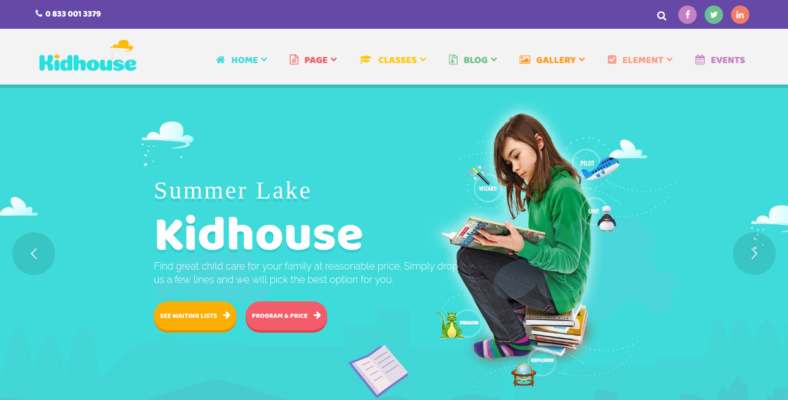 If you are looking for a cute-looking WordPress theme that is appealing to kindergartens, then KidHouse is definitely for you. This creative theme has more than four homepage layouts variations, widgets that have been premade for your convenience, and distinct sidebar variations. The theme is compatible with WordPress versions 4.8.x and went through meticulous testing before it got approved. It has also been optimized for speed, effectively reducing loading time. It is compatible with various browsers as well, namely FireFox, Opera, IE10, Chrome, and Safari, all of which are popular web browsers. 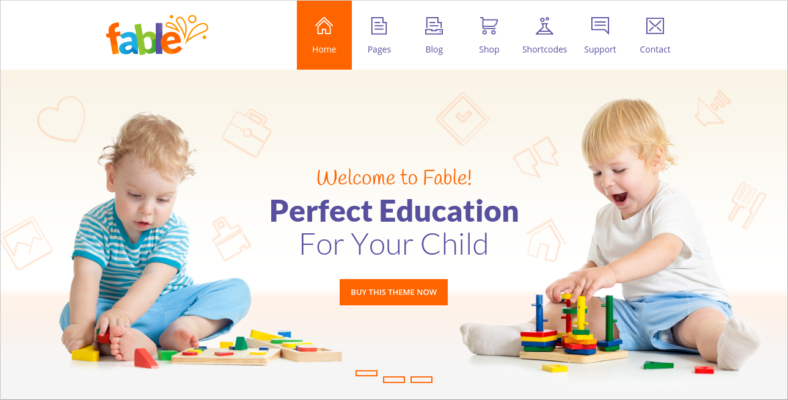 Fable is a WordPress theme that was designed for kindergarten websites. It was last updated on August 28, 2017. The template is fully responsive, which means viewing it on a desktop, mobile phone, or tablet wouldn’t lessen the quality of the site’s aesthetics. It has a built-in timetable, which is perfect for scheduling the classes of students and teachers. The page builder has drag-and-drop functionalities as well, which means a less stressful theme editing process. There are more than 35 content elements and shortcode generators to further enhance the theme’s functionality and, with the theme styles panel, you’d be able to create a stylish WordPress theme. Careland has a responsive design and it has focused most of its concept on being viewable on different types of devices. But that’s not the only thing that it has to offer because it has a special feature hidden up its sleeves. While most kindergarten themes would require a plugin to add custom events, this theme doesn’t need one. Custom events have been added to its support and functionality, letting you create and add as many events as you’d like. You won’t have to download any plugins as well, which saves you time and effort. It can also support a blog type of post, basically, make it function like a blog WordPress theme. The site may look like it is dedicated to offering babysitting services to other people, but it certainly doesn’t limit itself with just that. Baby Sitter has over 650 top Google fonts integrated into the theme, giving you an amazing amount of freedom to personalize its typography to fit your preference. Transition effects are very important when it comes to sliders and the template just so happens to have 12 of them that you can play around with. It is coded with CSS3 for animation and HTML5 for functionality, making it one of the best and fastest baby WordPress themes. It is safe to consider NT PRISKUL as a mobile WordPress template because of its responsive design towards mobile and tablet devices. However, that’s not the only thing that makes this kindergarten theme amazing. One of its main features is the drag-and-drop content maker, allowing you to add any type of content with just a click and drag of the mouse. You get to showcase the teachers of the school as well and you can input some of their credentials on the OUR TEACHER PAGE. Meanwhile, the CLASS PAGE would be the perfect place to showcase the different classes and their schedules. 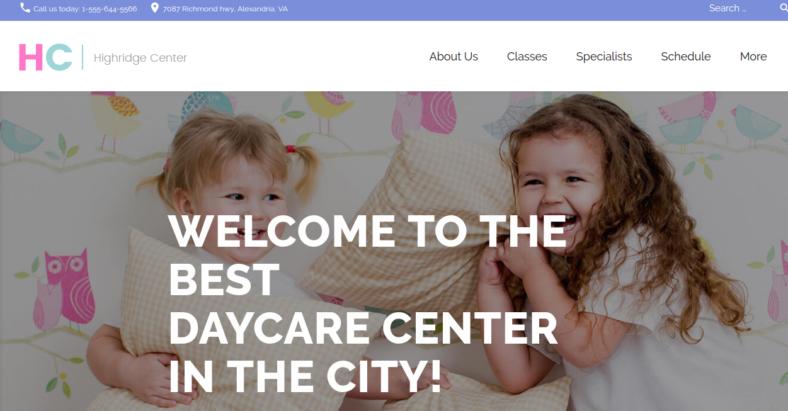 Kidix is a WordPress theme that centers its services around child care and kindergarten tasks. One of the theme’s main features is its easy-to-use interface and intuitive controls. It runs on Bootstrap 3.x framework and is also 100% responsive. There are available Parallax headers integrated into the theme and it has an unlimited amount of colors and color schemes one could choose from. The template is also SEO-ready for your convenience. You could safely say that this is both a fun and professional theme. Kidzz has an exceptionally customizable background, as well as multiple colors and fonts. You can also upload your very own logo, making your site more personalized without having to add a single code. You won’t have to memorize all the shortcodes as well because with the template’s help, you only need to select the required block and fill in the options. The theme also has more than 600 Web fonts to offer and over 100 shortcodes, along with a sidebar generator. There are unlimited amounts of sidebars, sections, slideshows, portfolios, and colors that you can experiment and play around with. It is also SEO-ready, making it an efficient SEO WordPress theme, aimed at attracting customers to your site. Cupid looks adorable and certainly child- and parent-friendly. With the theme’s design alone, you can be sure to capture plenty of parents’ and kids’ hearts. With this template, you can import the demo with just a single click, without having to add or change any code. You also have unlimited combination possibilities with the theme’s modular shortcodes, so go ahead and play around with it. 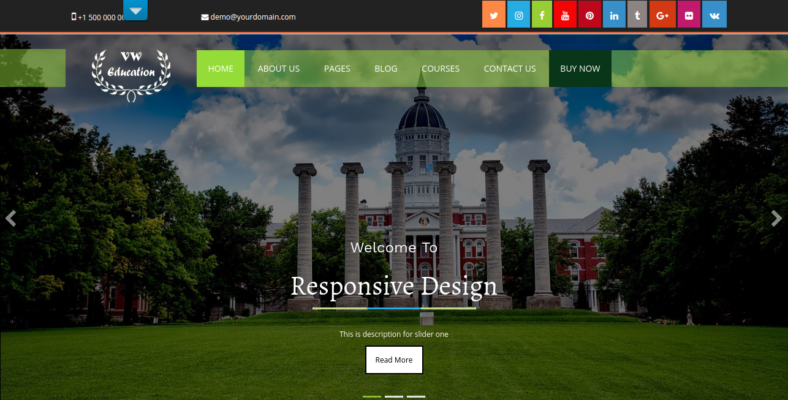 This education WordPress theme is also PHP Contact Form 7 ready, Search Engine Optimized, and translation ready. It has Google Maps integrated into it, too. If you like your themes to have a minimalist look, then you definitely should get yourself Dreamy. 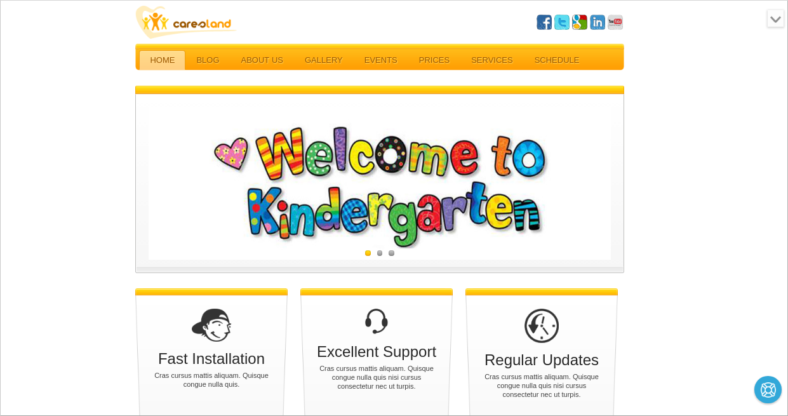 This kindergarten theme has a simple and clean design, but its functionalities still make it professional and useful. Font Awesome has provided the theme with more than 300 beautiful icons, all of which can be easily accessed via the shortcodes. The custom widgets will definitely add more functionality to your site and some of them are Testimonials, Newsletter template, and Twitter. This is a minimalist WordPress theme that every design conservative folk should get. Also, it has PSD files that you can customize if necessary. If you are on the lookout for a completely different kind of kindergarten theme, then Smarty is what you are looking for. It has video tutorials, forums, and even live chats. The online documentation is very accurate, reliable, and pretty easy to follow. With over 800 popular Google fonts to choose from, you can certainly edit the theme’s typography to your heart’s content. It also has 18 pre-built page templates, perfect for those who are very meticulous about personalizing the theme for their site. This is truly a flexible theme, capable of catering to the various needs of its users. 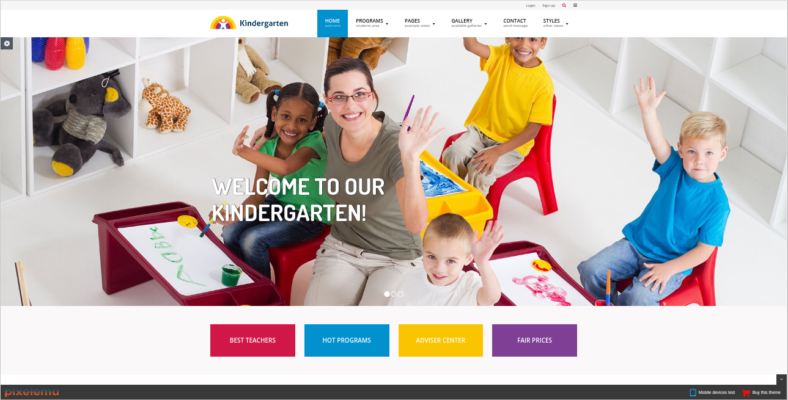 With the numerous kindergarten school website themes we have provided, you now have a higher chance of finding the template that you are looking for. All you need to do now is try them out, same as doing a test drive with a car, and find out which one you like best. But it is important to remember that what you should really be looking at are the features that each one could provide. Every single one of them has their own unique feature set for you to discover.